Only a few hours before leaving the territory of Laos. A month has passed and I couldn’t prolong my stay, my passport was stuck In Indian Embassy pending they want to give me a visa. Crossing a border is always accompanied by the feeling of not having seen enough, especially passing beside many beautiful things. I ran out of time to go to the extreme south, where the Mekong river gets lost between 4000 islands before continuing its journey to Cambodia. I started walking the northern mountains that are still very wild, then the center with its old colonial cities such as Luang Prabang or Vientiane to finally end in the imposing Khammouane southern valleys . This small country surrounded by 5 borders is one of the wildest of South Asia. There are only 6.5 million inhabitants of which 33% distributed in three major cities. A small density for lots of nature, perfect for a sound recorder. 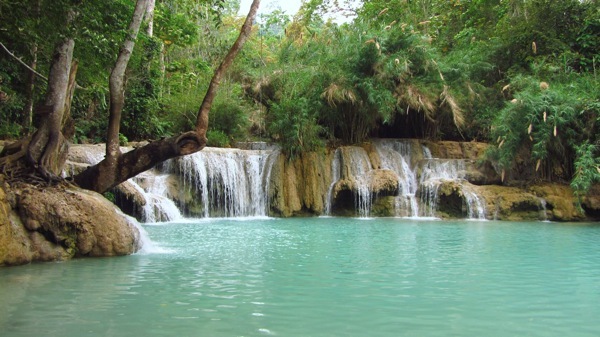 Unfortunately, these landscapes are changing quickly, Laos is booming. They build with turn of arm, burn forests to make way for cultures and northern ethnic slowly migrate to the cities.